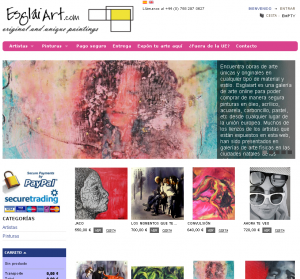 esglaiart.com represents an online shop where you can buy paintings online in any country in an intuitive and secure way. The philosophy of this site comes from the need to create a tool for artists to promote their works around the world and not be constrained by geography. A global showcase. The competitive trump card is its simplicity and clarity as online store offering unique and original paintings always, unlike its competitors, who sell both originals and replicas, contain too much information and become confusing to the user. Esglaiart allows easy navigation between its two main categories: by paintings and artists. We have an initial release of 4 artists with a total of over 100 works of different materials, sizes and prices. In the future we plan to grow but always in a controlled manner and with quality. If there are artists who want to exhibit their work online do not hesitate to contact us. Our main market is Europe but do not rule out that an artist can export their work to countries in another continent. Another competitive factor is esglaiart seal of quality. Any work exhibited on our website has the guarantee that we personally know the artist and their paintings have been personally checked. Being of the country they are. As a trusted payment method for the user, what better than using the most extended and safest in the world, PayPal. All transactions are made in a secure and encrypted mode, not allowing any third party interception of data. Another factor is the detail in the return policy and delivery, always seeking the best balance between the artist and the customer. The boxes are wrapped and protected between sheets of wood and the customer has the option to return the work if not satisfied and announced until 48 hours after receipt.